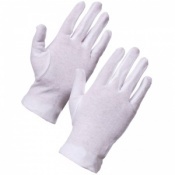 The Supertouch Cotton Gloves - Forchette 2550 are great for delicate tasks that require a gentle touch. The Supertouch Cotton Gloves - Forchette 2550 are fitted cotton gloves that are ideal for product inspections, valeting and working within hygiene rules. The product code for these gloves is 2550. Through this listing, you can purchase the Supertouch Cotton Gloves - Forchette 2550 in case quantity, getting 500 pairs of gloves at a discounted price. Ideal for fine handling and compliance to hygiene rules, this bulk pack allows you to save money on your essentials. With each glove being made to the highest quality, this bundle is sure to last even a large-sized enterprise a significant amount of time.